When playing the snare, you must strike both the head and rim of the pad. When playing the cymbal, you must strike both the head and rim of the pad. Choking the cymbal's edge with the hand immediately after hitting the cymbal makes sound stop. the unit can be seen, tested, played in our Music Source North Edsa..
Wow, I like. Super mahal kasi Yamaha & Roland. Pero in terms of durability, ok kaya mga 'to? i believe durability will depend on how you take care and play this electronic drums, and besides we give warranty on our electronic items anyway..
again we are not here to compete with a yamaha or a roland electronic drums, just like when we brought stagg cymbals here, we have no plan to compete with a zildjian or a sabian but to give a quality alternative to drummers, we brought medeli here to give our local drummers option and solution to the expensive cost of electronic drums. panalo tong E-drums na to, tinesting ko lang ito kanina lang sa TMS, natutukso din ako kasi 30k siya. laking tulong nito para makapraktis ako kahit gabi. So what can you say about the sound? And the build quality? yung sound, ok naman siya,but nung ni-try ko mag ghost note, parang kelangan mo pang bigatan nang palo mo ng onti lang. hindi rin crashable ang ride pero sabi naman sa akin ni sir clint (tama ba?) naadjust din naman daw yun. pwede daw gawing crashable yung ride.pwede mong iadjust sa gusto mo. (pero hindi ko natry iadjust kasi 1st time ko pa lang makapalo sa E-drums. about dun sa durability, hindi ko lang alam kasi sandali ko lang napalo ito. overall: imho, panalo na itong drums na ito. kumpleto na w/ single pedal na, okay na sa akin yung tunog nito. try niyo na lang ito sa tms para mahusgahan. Ganito kasi kailangan ko e. Para makapag-praktis ako ng wan tu sawa without disturbing the whole neighborhood! panalo tong kit na to. nakita ko tong dine-demo ni robert dela cruz this past sunday, nung nadaan akong TMS. kung di mo alam, isipin muna ang GMG bago ang lahat: Google Mo, G**O! ask ko lang sir pwede ba kabit to sa mixer ng alesis firewire? thanks!!!! cheers to this edrums yahooo!!! just came from TMS earlier. sir robert let me test the E-drums. out of ten, i would give it a 9.
what i like most is, you can have a rim shot, cymbal choke. the pads also feel realistic. 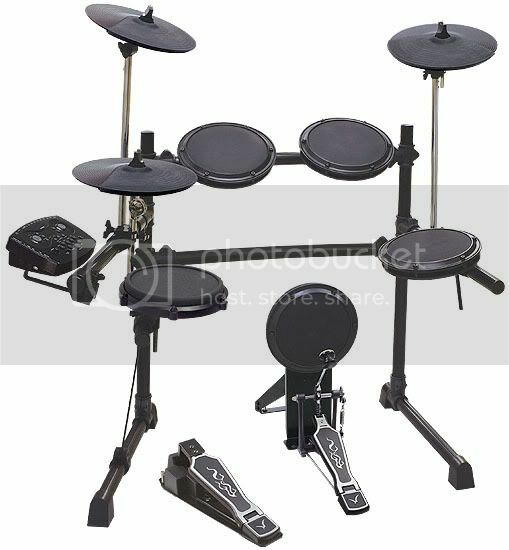 especially the bass drum which can be used with a double pedal. very affordable. perfect for silent practiceing. sound qualiy is very good too. the hi-hat release is not very responsive unlike yamaha's DD-55. Sorry about the excitement.. Now I need to be more......... PRAYERFUL!!! Arghh!!!! Need to test it na!!!! Sana masiyahan ako para mas lalo akong mapapray!!! Wah!!! Whew! And I thought I'm gas free!! Ser JP, me installment plan ba dito? anong cards? ayos to ha? mura... sir. san made tong elec. drum? All the info found on the website could help. Medeli seems to be a promising brand of electronic musical instruments. tsaka request, pede ba kayo magpasok nito? Medeli is a Hong Kong based company established in 1983 and is dedicated in producing high quality products for the market. Their product range includes digital drums, digital pianos & keyboards. other models will follow, including the DD-6 practice pad. yung dd6 practice pad lang hindi ba sya yung parang roland handsonic? yes! peeves24 is right! the price is very attractive. I bet after testing, you would have to pray a lot more for some "monetary blessings"! yun na ihanda na ang pang GAS!!! !